With two unique flex points for height and angle, the Daylight Slimline LED Floor Lamp lets you swiftly shed light exactly where you need it — and do it in style. This stunning brushed chrome lamp looks sleek and compact, but it will surprise you with how well it lights up large work areas, studios, and home offices. The slim head gives you perfect lighting conditions, above your hands and below your eyes, with optimal shadow free lighting. The powerful, energy-saving, LED lights reduce eyestrain and offer true color matching. And with an integrated on/off switch on the lamp pole, the light is always right at your fingertips. 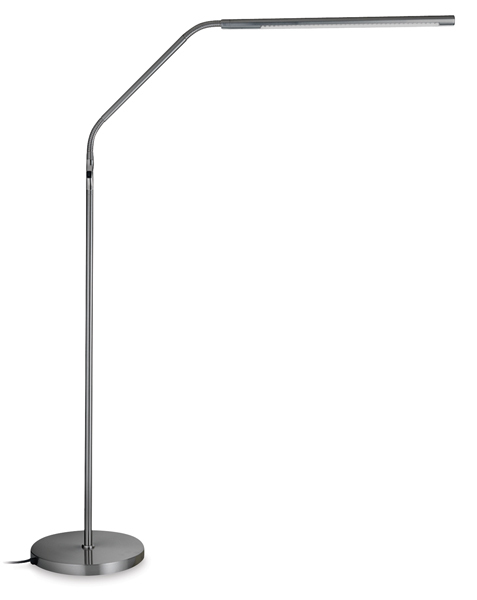 The Daylight Slimline Floor lamp adjusts in height from 40"-50" (100-130 cm) and has a 35" (90 cm) reach.